Which Pet Supplies are Necessary to Care for My Dog or Cat? So, you’ve decided to become a pet owner! This is always a great decision, and one that will provide you with years of love, fun, and memories from your new furry pal. Whether you’ve taken on a dog or a cat, there are plenty of pet supplies you need to have on hand around the home to ensure a happy, healthy environment for your pet, both in and out of the home. While some supplies may seem obvious, there are quite a few essential items that you may not initially be aware, so we’re here to help. Use this guide as a checklist when preparing for the arrival of your new pet. Cats are generally easier to have around the home than dogs, but they still require many pet supplies to keep them clean, entertained, and groomed. This is obviously ideal for eating and drinking. You definitely have plenty of options for food and water bowls, and the direction you take depends on your cat. If you are adopting a kitten, choose smaller, more shallow bowls before moving on to larger bowls. Ceramic and hard plastic materials are the safest, and choosing bowl sets with weighted bottoms can help keep the bowls in one place and prevent them from tipping over. Unless you plan on your cat living outside, a litter box is essential. Enclosed litter boxes give your cat some privacy while they do their business, and self-cleaning litter boxes are available for those that don’t want to worry about scooping out waste all the time. Be sure to position the litter box in an area away from the food. Cats can sometimes be expert escape artists, and if your cat is rarely outside, there is always the chance that it can get a little too curious and end up wandering away. Having a collar with identification tags on your cat can help someone else get ahold of you if they happen to find it. You will definitely be glad that you invested the $10-15 dollars in such an instance. There will be times you may need to transport your cat, whether it is to the vet, or to a friend’s or relative’s home. Be sure to purchase a quality cat carrier that is appropriately-sized so your cat is both safe, secure, and comfortable each time. Just like humans, cats need proper bathing and grooming products to ensure that their coat healthy and shiny. It is essential that you bathe your cat regularly and we recommend speaking with your local pet shop to discuss the best options on the market. We also recommend checking out how to make your own homemade cat shampoo. All pets need toys, right? Your cat may spend plenty of time sleeping, but its active times should be spent playing, whether it is with your assistance, or on its own. There is definitely no shortage of options for toys. Try to mix things up a little, and get a gauge for what your cat prefers. Avoid toys that have small parts or pieces that may come off. These items are not necessarily essential, but they are strongly recommended for a happy, healthy feline friend. Cats love to scratch, so unless you want them practicing on your furniture, you will need to invest in a scratch post. Look for posts that are over a foot tall, and include a sturdy base. Regular brushing is beneficial to both you and your cat. A brush helps remove loose hair, cutting down on excess shedding all over your home. Your cat is benefited by avoiding hairballs when cleaning themselves. Look for cat-specific brushes. Fleas can be more than an annoyance for your cat — they are also troublesome for you, not to mention the risk of diseases. 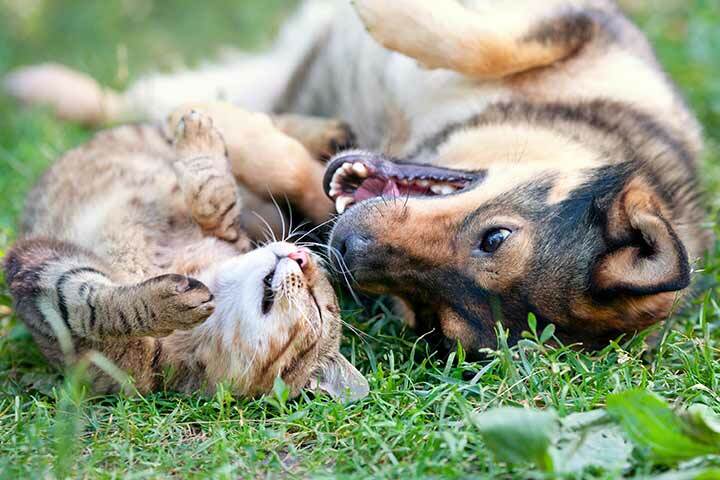 Flea collars, shampoos, and topical solutions are all effective methods for battling fleas. Messes sometimes happen, and when they do, you want to be able to clean them up and remove the smell immediately. Enzyme-based cleaners are gentle on fabrics and surfaces, while effectively breaking down smells and stains from your cat. The idea of brushing your cat’s teeth may seem silly at first, but it can be very beneficial to their dental health. Specialized toothbrushes and toothpastes made specifically for cats can help you keep your cat’s dental health in prime condition. Owning a dog is one of the most rewarding experiences one can have, regardless of the breed you choose. Just like cats, dogs need numerous supplies to ensure their health, happiness, and safety. Here are the essential items you should make a priority from the start. Weighted bowls are best to keep them from tipping over and moving around. If your dog is eating too fast, consider purchasing a special bowl with dividers that makes your dog have to work harder to get smaller amounts of food. Taller dogs may need a bowl stand to elevate their food and water bowls to a more acceptable height, preventing them from having to bend all the way down while chewing and swallowing. Dogs need their own special spot to lounge and sleep on in the home. Not only does this encourage them to stay off of your furniture, it provides them a sort of refuge and sense of ownership over a particular spot. Be sure the bed matches the dog’s size, and includes both a washable cover and inner. Crates can serve a variety of purposes for your dog. Crate training is a common technique that acclimates your dog to being comfortable in a crate when you are away from the home. Many dogs actually end up preferring their open crate to a bed elsewhere in the home. Depending on your dog’s size, the crate can be used to transport your dog, or provide them a secure place to be confined if you bring them with you to another home. Even if you do all you can to prevent it, there is always a chance your dog can get loose and run away. A properly-fitting collar with identification and rabies tags lets others know that your dog is up to date on essential vaccines, while also giving strangers a way to contact you if your dog gets loose. Dogs love toys! Balls, frisbees, ropes, chews — you have many directions you can go. Work with your dog to see what it prefers, and be sure to leave a few chew toys out in your home to prevent your dog to turning its attention to furniture and clothing. Avoid toys with synthetic stuffing, and steer clear of toys with pieces are small parts that can come off and cause the dog to choke. Consistent grooming will keep your dog’s coat healthy, while proactively removing loose fur that can get all over your home. Be sure to keep some dog shampoo on hand in case your dog gets messy outside. Your dog needs to be walked! Look for a quality leash around 6 to 7 feet in length that is comfortable in your hand, and fits securely on your dog’s collar. The following dog supplies aren’t absolutely necessary, but they can make life a lot easier for both you and your canine. Baby gates serve the same purpose for your dog as they do a baby — keeping it confined to one area. This is very helpful for growing puppies, and also for dogs you can keep in a certain area of your home while you are away, or when company is present. Certain breeds of dogs have nails that grow much faster than others, causing plenty of discomfort and unwanted scratches. While having a dog groomer handle this aspect is always the best idea, keeping nail clippers at home allows for you to keep your dog’s nails trimmed in between visits. Responsible dog owners clean up after their dogs when at the park or out for a walk. Doggie clean up bags are small, light, and perfectly sized to carry around when you and your pooch are out and about. Dogs can be prone to messes at times, whether it’s due to potty training, illness, or just an accident. Enzyme-based cleaning products are the best way to both clean and neutralize the messes and odors in your carpet and fabrics. These pests are a concern for your dog’s comfort and health. Specialized shampoos, collars, and topical solutions can both treat and prevent flea and tick problems. Clicker training is the most popular form of dog training, and for good reason. This simple device makes a distinct clicking sound with a soft press of a button. This sound is made when your dog does the right thing during training sessions. Treats are a must-have for rewards, and sometimes just because. Use them during training, in between meals, or just before you leave the home for an extended period. Need Help with Your Pets? Contact Paw Pals! Paw Pals can help fill the void during times when you cannot be with your pets. From dog walking to in-house pet sitting, our friendly and loving staff provides personal and attentive care to your precious pets day and night! Our convenient services ensure the well-being and happiness of your pets when you are away, giving you peace of mind and a better life for your pets. Contact us today to learn more about what we can do for you!